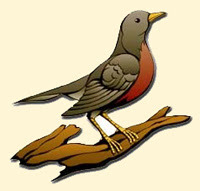 Despite this drawing, robins really are ugly birds. Their breasts aren't really red, they are a rusty orange. They have an unattractive unfeathered white ring around their eyes that makes them look like they have a serious case of conjunctivitis. And they are larger than you'd expect. Over the past week, we have had a lot of them rummaging around in the yard pulling up worms. Yesterday, I counted a dozen in our back yard alone. It's amazing that they can spot the tip of a worm, nab it, and pull it out of the ground to gulp it down. I suppose at this time of year, their brains have evolved to do two things...hunt and mate. Some of the birds are really fat. I suspect those are the females and carrying around eggs. I think they can lay up to four bright robin's-egg blue eggs. They like to nest in our spruce trees. I told my mom that they had gotten so fat I was going to go out into the yard and wring one of their necks and cook it up for dinner. She had a good laugh about that!